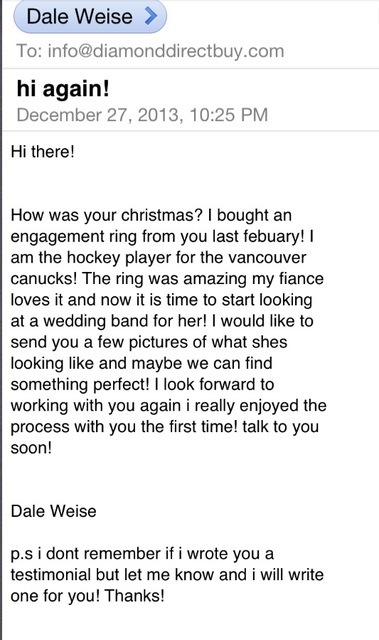 DALE WEISE NHL Pro Hockey Player bought his ENGAGEMENT ring from me ! I got This message after the ring was delivered " Anna ...Ring JUST GOT HERE .... SHE LOVES IT thnx it was a real pleasure doing business with you - Dan"
BELOW ARE REAL TESTIMONIALS PROVIDED BY CLIENTS OF DIAMOND DIRECT BUY OVER THE YEARS. Linda Y -Canada Director of Channel - North America. My ring was purchased through Anna and she did an incredible job bringing my vision to life. The finished product looks outstanding and beyond what I had envisioned. Anna is amazing to work with and completely patient, thorough and honest. I will use her again and absolutely recommend her to anyone I know. My fiancé and I could not speak more highly of you Anna. We are both so pleased with all the jewellery we have had made by you and we keep passing your website on to friends and family. We also look forward to the next time we use you! We are both from Australia and had been recommended to you by a friend. We could not thank them enough for passing us on to you, as we had been searching for the perfect jeweller to make our wedding bands and engagement rings. We both did our research and had a pretty good idea of what we wanted and started getting quotes from local jewellers and jewellers from bigger cities around Australia. All the quotes we received were roughly around two - three times the amount we were quoted by Anna. Our ring shopping started in Jewelers Row. Seemed like everyone we talked to told us to go downtown. However, we did not have a good feeling about our purchase, and the sales associate seemed to give up on finding the perfect diamond within our budget. Allen and I felt like we were settling. This is when I started researching different options online. About six months ago I called Anna frantically. She insured me that we would be taken care of, and she would do everything in her power to find the ring of my dreams. I have nothing but positive things to say about Anna. She helped us find the most beautiful ring that signified our love and commitment to one another. Anna went out of her way and worked day and night to make sure we were happy. We couldn't be more pleased with our purchase. I will be referring all of my family and friends in Chicago and back home in Ohio to Anna! We will be picking out our wedding bands soon, and we can’t wait to work with her again. We feel truly blessed that we found Anna who was so trustworthy, reliable, and understanding to work with us during this important moment in our lives. I cannot thank her enough for everything she has done. Hematology/Oncology FellowThank you so much for the beautiful 3.25 carat engagement ring. It is just exquisite. Anna was very responsive to my questions and provided videos, appraisal information and even custom designed a matching wedding band for my ring. The diamond appraised for many, many thousands more than I paid. As a busy physician, it was also helpful that everything was coordinated around my schedule. I highly recommend her to anyone looking for a beautiful, unique piece of jewelry. At first I was a skeptical at making such an important and personal purchase online from someone I had never met or had dealings with. I would say to any prospective buyer "Relax" Anna was simply wonderful to work with in every respect. She got me a very impressive stone at a great price! I have purchased a ring from Anna twice, which speaks to how highly I think of her. She is great to work with and very well priced, I would recommend her to anyone looking for a diamond.
" SHE LOVES THE RING THANK YOU ANNA"
Anna has access to very large, beautiful diamonds that are certified and incredible quality. Anna is extremely prompt, professional and can absolutely be trusted. I highly recommend her - and my wife adores the new ring I bought her! Anna is a very pleasant person to work with. I have only worked with her for a short period of time but she was pleasant and professional. I also see her as a fair and trustworthy person and I would not hesitate to work with her again in the future! I found Anna on the internet. I was a little skeptical looking for such important purchase. Anna is so wonderful to work with she took away any fear I had. She is super responsive, very creative and just a sheer pleasure. You will be completely satisfied with the entire process of her understanding your ideas, designing the perfect piece, ease and convenience of delivery and the follow up afterwards. I highly recommend Anna. Thank you for everything Anna. I will definelty contact you without hesitation for my future jewelry needs. Anna is very professional and patient. I picked out the perfect diamond for my fiancé's engagement ring the second time I met with Anna. However, it took me over a month to design the perfect setting. Anna worked with me every step of the way: she sent me photos, renderings of how the engagement ring would look and ultimately when the big day came for me to "pop" the question, the ring took my fiancé's breath away! I will be working with Anna for our wedding bands! When I was first introduced to Anna, I was very impressed by the professionalism and personality she displayed towards my situation. I had been looking for an engagement ring for quite some time without any luck. After giving her my requirements, she came back and found EXACTLY what I was looking for in only a week or so. I will definitely be using Anna again for all of my diamond needs!!! Anna was recommended to me from a friend who knew that I was in the market for an engagement ring. From the minute that she first reached out to me for an introductory phone conversation, I knew working with her was going to be the right choice. Anna is very personable, knowledgeable about all things related to her products, and genuinely cares about her customers and the end results of their designs. Anna helped me pick out the perfect stone, design the perfect setting, and guided me throughout the entire process to give me the confidence I needed in making this very important decision/purchase. I highly recommend Anna personally, and will always send my friends and colleagues her way when they need a great jeweler. I know I'll be back for our wedding bands! I recently got engaged on 12/23 and would like to thank Anna for creating the most gorgeous ring for my fiance! She was stunned! Months before we sat down and discussed budget, setting and diamond shape. She gave us her most honest opinion in each area (she's an expert) and truly wanted to give us the best ring possible. 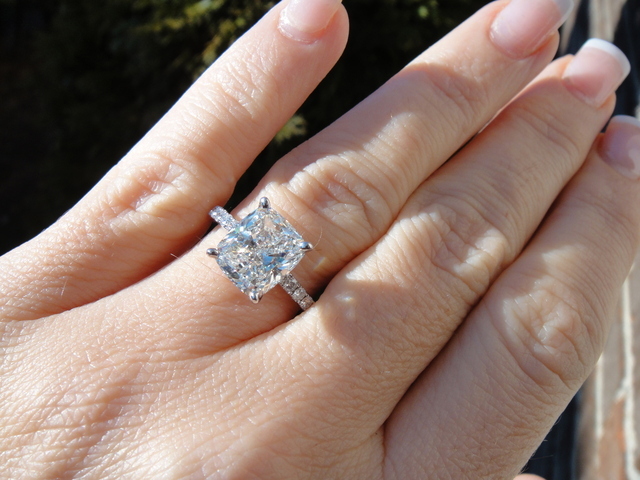 She can work with any price range or idea you may have to create your dream ring. I highly recommend anyone to her, you'll most defiantly get the most out of your money going through her instead of getting ripped off somewhere else where you pay for the name instead. Anna is truly our diamond girl and we'll be using her again without a doubt for our next jewelry purchase! I just got engaged over Christmas and couldn't be happier with my beautiful ring - thanks to Anna! Months ago, me and my now fiance sat down with Anna and went over every detail that I'd like for my ring and the results were amazing! She got us such a great detail and is extremely dependable. She will work night and day to give you the best quality ring! Just give her a budget and let her work the magic! You won't be disappointed! DALE T-USA Anna values timing and preparation. She possesses a passion for helping her valued customers accomplish their jewelry investment goals. Anna is respected as an authority in her specialized field. She is always willing to offer incentives to her returning valued customers. Anna knows the value of networking, and she helps her customers to make the right decisions matching their needs. JAKE D. - USA Anna made my first diamond buying experience a great one. Her knowledge and recommendations assisted me in making an informed decision. Her consistent service gave me the comfort to make such an important purchase from out-of-state. Her openness to my suggestions allowed me to create a personal design and the value I was able to get went unparalled when compared with other brokers and jewelers. Anna did an excellent job of procuring a diamond that met both my financial and structural parameters. Her communications were accurate and without "sales lingo," and in the end, actually "promised low and delivered high." Thus, I am happy to recommend Anna as a highly professional, extremely credible jeweler. You can trust what she tells you. What more can I say? I recently purchased an engagement ring from Anna for my (now) fiance. I shopped around exhaustively both in person and online for more than a month trying to fond the right ring. This is obviously a big deal and a purchase that I will only be making once, so it had to be exactly right the first time. The ring that I bought from Anna is just that. My fiance loves it and still hasn't stopped staring months later, and the price that Anna is able to provide is far better than anything else I found anywhere. MURAD F While looking for my special piece of jewelry : ) , I accidentally stumbled on Anna’s services and I couldn’t be any happier. I honestly can say my experience with Anna was AMAZING. She is very professional, compromising and accommodating, honest, and straight forward. Most importantly the deal was unbeatable. My background is in risk and I have to look into all the details before recommending or communicating anything. Having said that, I did plenty of due diligence prior to our dealing – simply I can sell what I got today and profit. THANK YOU Anna and best of luck and I look forward to working with you again. Anna is an excellent private jeweler. She is serious about helping you acquire the piece you want and goes above and beyond to help you through the process in a safe, confident manner. She saves you a lot of money by simply operating with zero overhead and sourcing through her long-established supplier relationships in Europe and elsewhere who provide her great terms. (yes, she ensures you still get a fancy box for the ring so your presentation is world-class). I believe she specializes in high-end diamond engagement rings but she does have access to a variety of other gems, settings, necklaces, watches and such through her suppliers. I will definitely go to her for any future jewelery needs. Great experience!! Anna found us exactly what we wanted. If you are looking for an EGL, EGL USA or GIA, Anna will find it. The shipment to Canada was smooth and effortless. Anna is very knowledgeable and available to answer questions 24/7. We look forward to getting our wedding bands. I used Anna to buy my fiance an engagement ring 2 years ago. The entire process was pain free and her inventory is unbeatable. Not only does she carry some of the highest quality diamonds, she has the best prices I could find (I spent over six months looking pricing diamonds). DiamdonDirectBuy is a class act and I highly recommend Anna and her company to anyone looking for a high quality diamond at rock bottom prices. Just gave my girlfriend (fiance) the ring I bought from Anna. She loves it! Not to mention, I got a fantastic value! Anna is a amazing professional and very good at what she does, she guided me through buying process offering candid feedback and opinions along the way. I highly recommend Anna and look forward to doing more business with her in the future. When I began my search for the perfect engagement ring I started where everyone starts in Chicago...Jeweler Row. I was shocked on how expensive the diamonds were and thought, there is no way I will find the ring that I want. A friend of mine referred me to Anna. He had nothing but amazing things to say about her and her diamonds. So I went to her website and contacted her. We met and she showed me diamonds that were bigger and better then the ones i saw on Jeweler Row for an amazing price. She was very knowledgeable about diamonds and settings. I went home to think about the offer she gave me. I have to be honest; I was apprehensive and thought to myself why are her prices so low? I looked over all these recommendations and turns out other people I know dealt with Anna too. I felt comfortable and bought the perfect ring. Anna had the ring set, cleaned, in a box, appraised ready for pick up in a day. Anna goes out of her way to help you find the diamond and or ring you want. She will not rest until you are happy. I plan on going back to Anna for the wedding bands and any other jewelry I need. Bottom line she is the best. Two different trustworthy people referred me to Anna. Not only was she professional and curtious, but she went great lengths in order to get me the piece I was looking for. I was very impressed with her work and would be grateful to do business with her in the future. 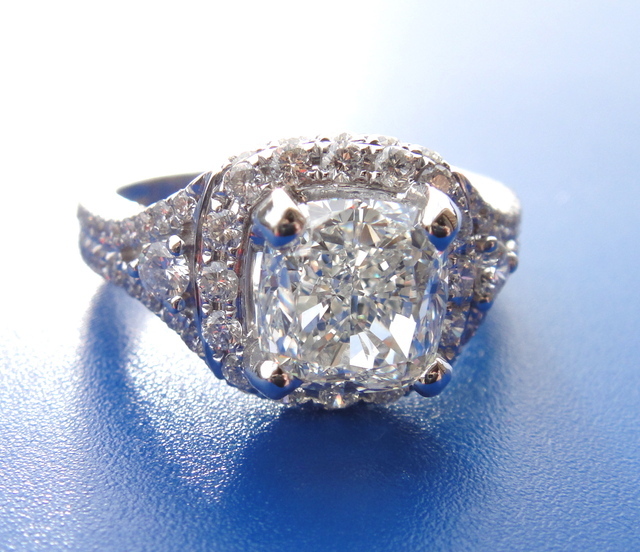 I worked with a number of Jewelers and diamond brokers in finding and purchasing my fiancee's engagement ring. Anna was so helpful, direct, informative, she never stopped looking for just the right stone and went well above expectations in locating and convincing me of the right balance of stone attributes. She turned the setting around in a very short time. My fiancee was thrilled...and with one look at it on her finger I knew we made all the right choices...and at a substantial savings over a jeweler. 5 Stars! Anna is a consummate professional. Her selection, quality and pricing saved us both time and money. I highly recommend Anna and her company for your jewelry needs. We will be working with her again! I met Anna last month when looking for diamond for my fiancee. While the world of jewelery can be quite intimidating and daunting to anyone who doesn't have any familiarity with it, a trustworthy expert is invaluable. So, I was quite lucky when I stumbled across Anna. She was not only able to help me find figure out exactly what I wanted, she got me a deal on a certified ring that was stunning (and the price untouchable anyplace else!) Not only is she very knowledgeable, she has high honesty and integrity, and is a true pleasure to work with. I will definitely be back to get jewelery from her in the future. Highly recommend!! My wife lost her wedding ring and needed to replace it. Spent a lot of time at the mall jewelers and not only did I not find what I wanted, but their prices were outrageous. I found Anna on-line, but was hesitant to buy from someone I didn't know and over the Internet. I called her and quickly realized that she was an expert in her field and was able to ask the right questions as well as give me the guidance I needed. I not only got the ring I wanted, but at a great price and with the diamond certification. I took it to a local jeweler to get it appraised an it appraised at almost double what I paid. A couple of months later one of the prongs came loose. Anna was great to deal with and paid for my repair with no questions asked. I would highly recommend her and buy from her again. SAM B Anna was able to find and follow through with a perfect choice for my wife and myself. For over 2 years my wife continues to receive compliments on her engagement ring on a regular basis, and that would not have been possible without Anna. Anna was a pleasure to do business with. Her passion, expertise, attention to every detail, and patience are second to none. It's rare to find someone who puts the best interest of the customer ahead of everything else as much as Anna does! I will certainly do business with Anna again in the future. I will never go anywhere else for jewelery. Simply put, Anna cares about her customer more than making a sale - she has a genuine interest in making her clients happy. She has the best value, an impressive understanding of the market, and she is very easy to talk to. I can't stand pushy salespeople, and she is exactly the opposite - patient, friendly, and down-to-earth. After searching everywhere in the area and on the internet, I feel like I've got an "in" in an often intimidating and confusing industry. Anna was amazing and very knowledgeable about her product. Impeccable customer service, and worked very well with my fiance who has never bought a ring before. She worked every step of the way with him until they found the perfect ring to surprise me! I absolutely love it, and get compliments on it daily. 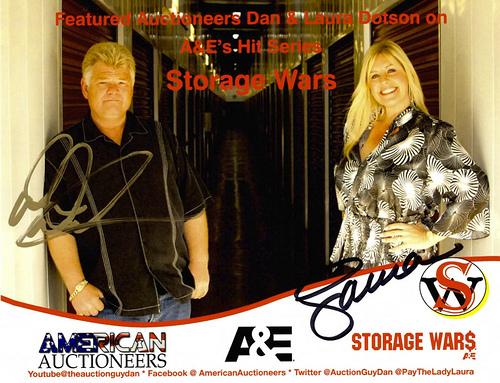 I brought it to a local appraiser and they told me that I got tremendous value and it appraised way over what my fiance bought it for! Thanks Anna! "I searched around for a while to buy a Engagement ring and was glad when I came across Diamond Direct Buy.com , Anna has great to work with ,very helpful and knowledgeable. Outstanding customer service that put me at ease with my purchase. I was also pleased with using www.escrow.com as form of payment which offered me extra piece of mind that I would and DID, get exactly what I ordered. JOE P Vice President Business Development at Pharm MD. As I was shopping for an engagement ring throughout the city of Chicago I realized that the service and value of Diamonds I was looking at were sub-par. I started to do some research about particular individuals that broker diamonds and other jewelery and quickly realized that I could get a much better diamond and a higher value at a significantly lower cost if I decided to work with ANNA , whe met me at a independent appraiser and I could NOT be more thrilled with the evaluation. Anna and Diamond Direct Buy made my investment process in the diamond I purchased such a good experience. 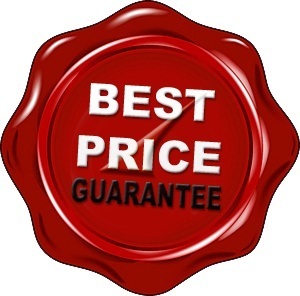 I found her selection and pricing to be top-notch and her business practices to be first class. The diamond I received exceeded my expectations and the ability to trust her with this large transaction, and being geographically remote, was a credit to Anna and her buisness. I was skeptic doing such a transaction online with such a great distance between my residence and Chicago. I am not buying a $40 t-shirt here. Anna is a pro and put my skepticism at ease. She is professional, patient and quick to provide great service without being pushy. I recommend going to her if and when you are in the market. I can’t begin to say how thrilled I am with the diamond wedding ring my fiancé picked out for me! I gave him a slight idea and Anna blew it out of the water! My ring is a show stopper and I say that because there is a not a week that goes by that I am not stopped by people to comment on how beautiful my ring is and that all goods to the designer the one we trusted, Anna! I feel so comfortable calling her up if I have a questions how to clean my ring or to talk about wedding bands etc and she is always willing to make time for he customers. She partners with a fabulous jewelry store in Northbrook that is always happy to accommodate Anna’s clients and clean the jewelry for free in which they do a fantastic job. We plan to continue referring friends and family to her because there is no other service and diamond expert other than Anna! Thank you Anna for my beautiful one of a kind wedding ring I love it!